The main artist of the golden age of painting the Netherlands, Rembrandt van Rijn. The most talented painter of his time, engraver and draftsman, Rembrandt is known to the whole world for his works of art, which are stored in all the major museums in the world. His genre works are imbued with such a tense emotional state, sincere human passions and experiences, that with just one glance at any Rembrandt picture, anyone, even an unprepared viewer, is breathtaking. The artist’s skill is unquestionable – his contemporaries recognized him, his followers admired him. The painter’s workshop produced many talented students and endowed this world with hundreds of beautiful works of art. Most of the paintings by Rembrandt represent religious scenes, excavations from the Scriptures and legends. Such a picture is “Christ in Emmaus” or, another name for it, “Dinner in Emmaus”. 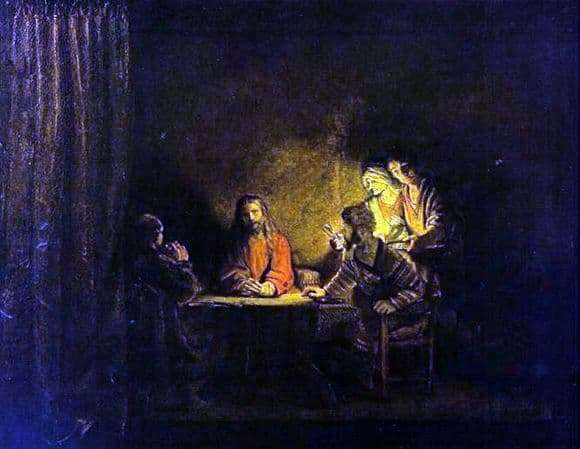 This is the most favorite story of Rembrandt himself, taken from the pages of the Gospel of Luke. The episode tells how after the crucifixion of Jesus, his disciples gather and arrive at Emmaus. This is a village near Jerusalem, where they are found by a stranger who tells the travelers the stories from the Scriptures and then shares the dinner in the house whose owners sheltered the disciples. The culmination of the episode is that after the breaking of the bread, the stranger opens to the travelers, like the resurrected Jesus himself, and immediately ceases to be visible to them. In this picture, Rembrandt writes the Gospel story is very simple. Dinner, illuminated by warm light, and the figures of people – it would seem, is not the best place for the miracle occurred. But it is precisely in such simplicity, which emphasizes the emotionality of the experiences of the characters, and the talent of Rembrandt stands out – the master of dramatic, but very close to man subjects.